A short stroll up the road from Villa Chiocchio there's a wonderful old-fashioned trattoria which teems with lively Italian families and offers the most delicious grilled meats, a sensational tiramisu and provides an authentic delightful farmhouse sort of feel. To continue the gastronomic theme there are of course dozens of sensational restaurants in the region and some of the country's most renowned wine estates. 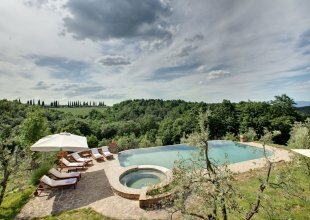 Equally Chianti villages offer a treasure trove of delicacies to bring home and enjoy in the comfort of your own private villa. Chiocchio is without doubt both perfectly positioned for a quintessential Chianti experience and also comes with an armoury of attractive features. It is an extremely well presented property set in 11 acres of beautiful grounds with a traditional cosy feel inside, but in this case cosy is not accompanied by fusty fabrics and dustiness, on the contrary Chiocchio is so well looked after that it belies its 12th century origins and offers WiFi and air conditioning in bedrooms. It is an appealing blend of comfort and elegance, large rooms brimming with character, rich colours, vaulted ceilings, large fireplaces, wood and terracotta. The library, drawing, billiard and dining rooms could all adorn the pages of any interiors magazine and the sensational country kitchen fills you with admiration. 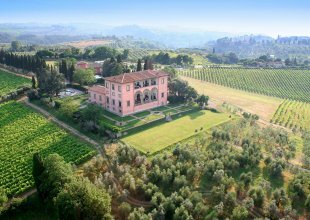 With its lovely interiors, tennis court, pool, bocce court and Italian gardens it makes for a sensational Chianti experience. N.B. During the high season, the owners live in a separate apartment with private entrance. There is a dog on the estate. The pool is open from mid May until mid September. Outside these dates, the pool can sometimes be opened on request.